Chairman Chang Man-Key (right) of the Korea Human Development Institute (KHDI) speaks at a seminar hosted by him in Seoul. Chairman Chang Man-Key of the Korea Human Development Institute (KHDI) will host a year-end reception at Convention Diamant in Daechi-dong, Gangnam-gu, Seoul on Dec. 22, 2011. Well over 200 opinion leaders including scores of local CEOs are invited to the “Night of Sending the Year Out” party in which the businesspeople will rub their shoulders to exchange information. The dinner party described by Chairman Jang as “Party of the CEOs, by the CEOs, and for the CEOs” will include song and other performances by the four competing teams of CEOs, a charity event, and the performance by the local pop opera (popera) group “El Luce” comprising five-male members. The four teams of CEOs will stage a saxophone ensemble, a magic show, and the harmonica performance for the prize-winning competition. The proceeds from the charity event will be spent for a special project for Malawi on the African Continent. The participants will be asked to donate their glasses and watches. “El Luce” operatic pop group composed of three tenors and one baritone and a base. They will entertain the guests with a variety of repertories. There will also be a special event in which the CEO participants will be asked to make a poem on the scene. Winners will be rewarded with various prizes. A lucky draw will also be included in the joyous dinner party. 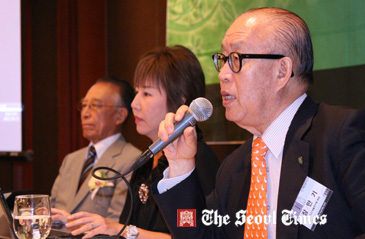 The whole party will be emceed by a local entertainer Kwon Young-Chan. A cocktail reception will start at 6 p.m. and will last for some 30 minutes. The opening performance will start 6:30 p.m., followed by a congratulatory speech. Dinner will start around 7 p.m. to be followed by a comedy show by Kwon Young-Chan. CEO’s singing contest will begin around 8 p.m. before the dinner ends with the “El Luce” performance. Established in 1975 the Korea Human Development Institute (KHDI) has been quite active in hosting seminars and breakfast forums on the regular or irregular basis. Who Is KHDI Chairman Chang Man-Key? Chairman Chang Man-Ki of the Korea Human Development Institute (KHDI) has been one of the busiest business leaders in South Korea. Chairman Chang has been hosting a total of 1,772 breakfast forums on Thursdays over a span of three decades. He still holds the early morning seminars on every Thursday. Famous scholars, powerful politicians as well as big corporate figures of Korea or from overseas have been invited for his forum. Back in 1970s South Korean was still one of the developing countries in the world. “That's why I decided to set up my institute,” he said. Since then he has been dedicated himself to developing potentials of the young businessmen and women for over 30 years. He is now 74. He served as a professor of business at Myongji University in Seoul before he started his institute over three decades ago. For details or inquiries please contact Ms. Kim Hye-Young at the institute at 445-1946.